In this lovely and innovative passive solar retrofit, an older adobe home transformed to become an efficient, modern house with a south facing sun room and a south facing two-story Trombe wall. It is also a grid-tied solar electric home that produces enough electricity to have paid for the solar photovoltaic (PV) system within the first 8 years. Currently, instead of paying for utilities, they receive a check for 80 to 90 dollars each month from the electric company. This house has a lot of solar goodness going on. The additions were built in stages to incorporate both passive and active solar elements. The original home is situated in the middle of the current house, sandwiched by the first addition to the south, followed by the two story addition built onto the northern side of the house (south facing). The southern facing sun room was the first addition to the home. The first addition the adobe home was the stick-frame sun room built to the south of the home. The early addition has both vertical as well as slanted, overhead glazing. It was built on a 4″ concrete slab floor that is its thermal mass. Prior to pouring it, they mixed in a pigment to give the floor a reddish hue. The windows (glazing) are homemade double paned glass panels. 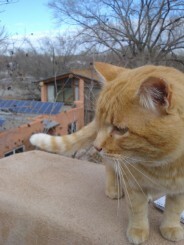 After building it, they found that the overhead glazing made the house too hot during the Albuquerque summer time. 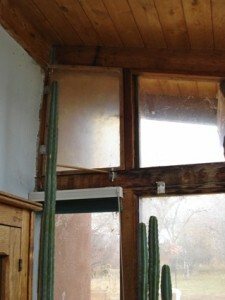 A hinged window can be opened to vent the sun room. Venting windows were installed in the upper west and east facing walls of the sun room. When open in the summertime, they allow ventilation into the space while allowing hot air to leave the room. 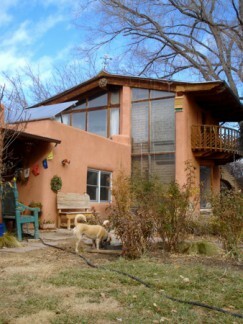 In addition to warming the house in the winter, the passive solar additions also allow more light into the adobe home. The original older adobe house was built in the traditional pueblo New Mexico style, with a flat roof and vigas, the logs supporting the roof. They were traditionally built with thick adobe walls and small windows, attributes that can lend to a darker house. 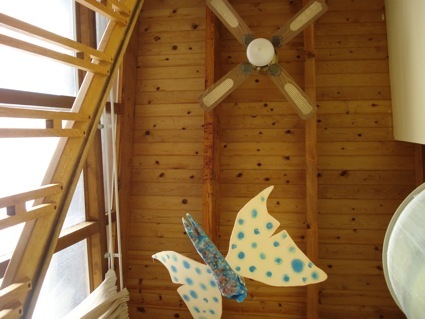 In addition to the sun room, overhead sky lights were also installed over the entry way and the kitchen. There is only one propane backup source of heat located in the dining room. The owner says that it is typically only used on winter mornings. The Northern Addition, Trombe Wall and Water Tubes! The two story addition has a Trombe wall built on the eastern side of south facing window wall. In the second stage of building, a two story addition was built to the north. The passive solar addition is wider and taller than the original house, so the sun can passively warm the south-facing, northern section of the building in the winter. On the eastern side of the building, a two story adobe Trombe wall is used. The Trombe wall is warmed by the sun throughout the day and then releases its stored heat into the house throughout the cooler evening and night. 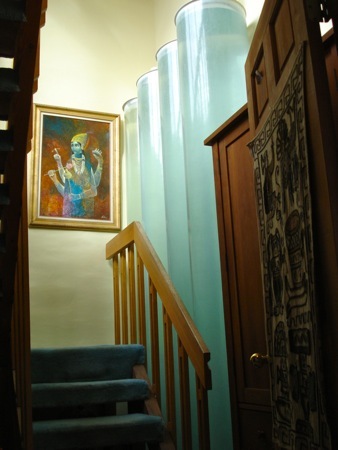 On the western side of the building, the southern facing windows allow the winter sun to hit a water wall located within fiberglass tubes inside the house. Because the house faces the south, an overhang is used to block the summer sun thus keeping it cool in the hotter summer months. 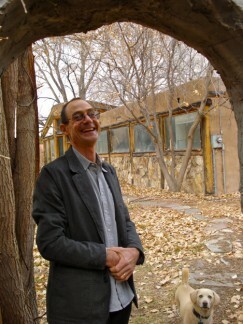 The adobe bricks used in the Trombe wall were purchased from an adobe brick company NM Earth. When asked about the process of building with adobe, and the builder echoed what people who build with adobe typically say, that it is a relatively forgiving, nontechnical material, and that adobe can simply be stacked up within a framed structure. When approaching the home, the second story gracefully exudes its artistic dominance over the older adobe. This is the inside of the two-story Trombe Wall showing the section near the roof. Going inside the house to see the other side of the Trombe wall, an open lavender room greets the visitor. 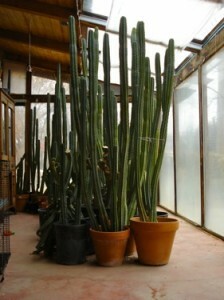 In order to keep it from getting too bright, they used glass bricks and a east facing bay window in the room. 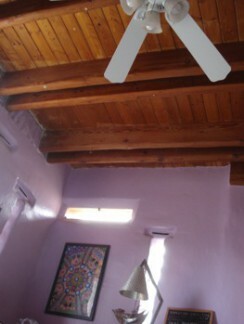 They kept a similar south western look throughout the house by building the same viga-style ceiling. Here another house that has a Trombe Wall. The layers of the house from inside to outside are: adobe, a vapor barrier of tar paper and wire mesh, followed by 2 inches of urethane foam insulation. (Because passive solar houses store and then release the sun’s heat through the colder winter night, the outer walls must be insulated.) This is followed by a layer of adobe plaster to the outside. The fiberglass water tubes allow the home to store the sun’s heat in the tubes. On the western side of the two story addition located behind the existing house, huge fiber glass tubes filled with water are situated to collect and store the sun’s heat in the winter. In regard to thermal mass, water has the ability to absorb and store the highest amount of heat, over twice that concrete or stone. The owner said that they were installed in the house over 12 years ago and are very low maintenance. He pours a little bleach in them about once a year to keep the water clean and free of algae. They have had the same city tap water since they were first brought into the house. 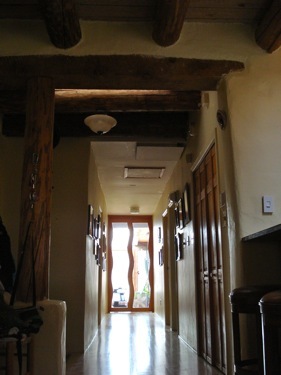 This is the view looking up into the rafters of the house. 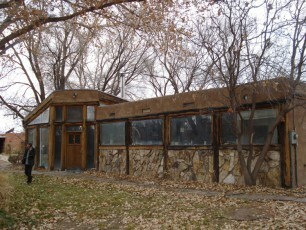 The southern facing glazing is on the left, and the fiberglass water tubes are on the right side of the picture. Here’s a view of the windows that face the south within the two story addition. Because of the orientation of the windows (facing the south) combined with the overhang on the roof and the positioning of the glass tubes, the house does not receive that much direct sunlight in the summertime, helping the house to stay cool. In the winter, because the sun travels a lower and shallower path, the winter sun hits the tubes of water on a sunny day allowing the water (thermal mass) in the tubes to absorb the sun’s heat, helping to keep the building warm. The tubes of water are a great way to add thermal mass to a building. As stated previously, water is a more efficient heat storage medium than concrete or masonry. For example, a cubic foot of water can store 62.4 BTU’s for each 1 degree Fahrenheit rise in temperature, while a similar volume of concrete can store only 28 BTU’s for each 1 degree F temperature rise. BTU (British Thermal Unit) is a unit of measurement that quantifies heat. 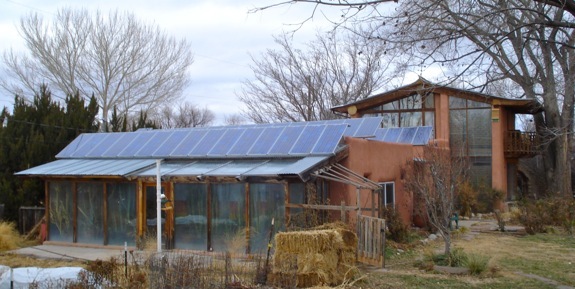 One BTU is the approximate amount of heat required to raise one pound of water by one degree F.
There are three rows of 15 panels on the roof of the adobe house that have already paid for their existence – and continue to pay to the owners for the solar energy that is generated. The last modification to the house was the integration of active solar on the roof to supply solar electric power. The active solar system was added in 2005 shortly after the first Gulf War, for practical and philosophical reasons. 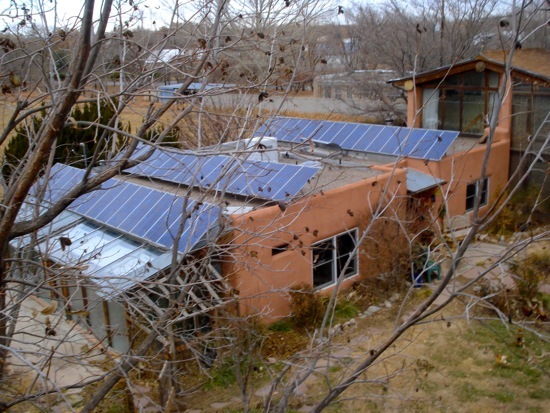 It was one of the first grid-tied active solar home systems added in the state of New Mexico. Debunking the false myth that solar doesn’t pay for itself, the system cost the owner-builder $30,000 and was paid for in the 8th year. The array is composed of three sets of 15 panels and is rated at 5KW. 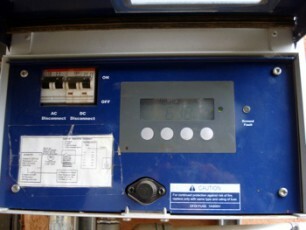 Because the home is grid tied and creates more energy than the home uses, the solar system continues to generate money. As a result, the household receives a monthly check from the electric company that varies between 80 – 90 dollars. Even on a cloudy day, the solar system was producing electricity. I visited the house on a cold, slightly overcast day in December. Notice that even on a cloudy day, the solar photovoltaic (PV) system was creating electricity. A passive solar sun room was added to the front of the house. 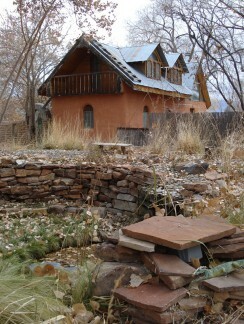 Looking at the addition from the southwest, one can see where the sun room joins the adobe. There is also a cistern that collects water from the roof. The tank is slightly raised, so when a hose it attached, via gravity, it is fed into the hose and to the garden. 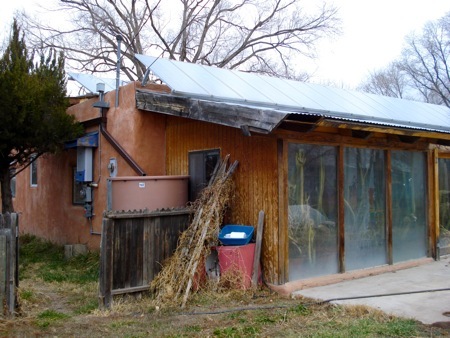 This house has shown innovative ways to add passive solar additions to a house. The inside of the home was filled with light and warm, even on an overcast day. While the different additions were added over many years, the result is a comfortable, modern and efficient home. To see more photos of the house, take a look at the photo gallery below. This house has a lot going on, built in stages to incorporate both active and passive solar. A passive solar greenhouse was added to the front of the house. The two story addition has a Trombe wall built on the eastern south facing side of the house. This is the inside (backside) of the two-story Trombe Wall near the roof. There are three rows of 15 panels on the roof of the adobe house. The sunroom was first built onto the home. The house is approximately 3000 square feet. Well said, but everyone needs to realise that adding Solar on their house is an asset that should increase the future valuation of their property if / when they come to a decision to sell. With the environment the way it is going we are not able to disregard any product that provides totally free energy at no cost to both the shopper and more significantly the world! Solar energy is a great asset, as the sun continues to shine pretty much everywhere. In this post, solar energy is not only free, but the solar panels and solar system have already been paid off, and the utility company pays the owners every month for the extra electricity that they push into the grid! I would love to do all this to my place in downtown Tulsa. I have a little bungalow in back that could be a great starter and then use my house and garage as a prototype for others in town. Who wants to come do this with us? I think that’s a great idea. 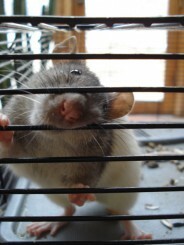 I’ll come and help! Really good to hear from you. You’re a bright beacon of hope and joy in everyone’s life that you touch.